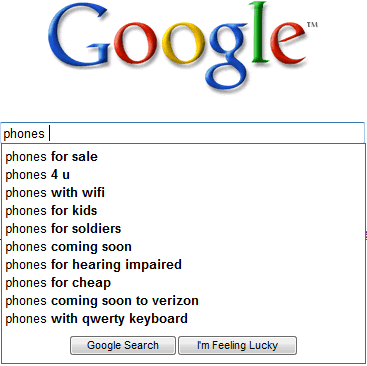 Google shows different search suggestions, depending on your actions. If you type some keywords in the search box, you'll usually see suggestions that start with your keywords. After performing the search, Google will show a new type of suggestions that include your keywords, but not necessarily as a prefix. Google assumes that you're not happy with the search results and you're trying to find a query that returns better search results. "but necessary as a prefix" -> "but not necessary as a prefix", I guess. "include your keywords, but not necessary as a prefix" → "includes your keywords, but not necessarily as a prefix"
"includes" because "a type" is singular. "necessarily" because it's describing the verb "includes", so it should be made an adverb. Mysterius: conclusion, these blogwriters doesnt know basical english. "...these blogwriter doesn't know basical English"
English isn't their native language. Notice the search totals are gone from the right of the keyword phrase. I wonder if this the symantec search. The problem lies with "a new type of suggestions" - "type" is singular, "suggestions" is plural. You can have a new type of suggestion/list/result/panel/drop-down etc. but not a new type of suggestions. The singular "type" can then be followed by "includes your keywords, but not necessarily as a prefix" but plural "suggestions" cannot, which is where the confusion lies. QED. Not nitpicking at all - grammar is grammar is grammar. U lia lia, I thought, I'll find some discussions about new google ssearch stuff, though it's grammar lessons going. Nice as well :) Always learning.